Last week people loved the Friday Fika post so much (was it the goat cheese and lingonberry sandwiches or the list of Scandinavian food spots in London? I’m not sure…) that I decided that it deserved to be a weekly series. I mean really, who doesn’t want the chance to sit down with a cup of coffee and a treat on a Friday? So from here on out every Friday will be devoted to fika in some way shape or form, whether it be a recipe, a look at a cafe or something entirely different. This is of course all quite fitting as my and Johanna Kindvall’s book Fika: The Art of the Swedish Coffee Break is coming out in less than two weeks. To say I am excited would be an understatement. As such, there is a lot of celebrating to be done. With fika, obviously. 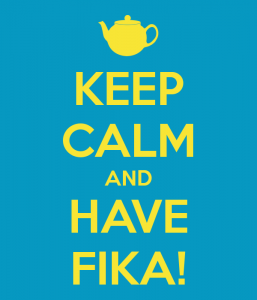 What is fika? Fika is the Swedish coffee break, both a verb and a noun, indicating the moment that you sit down with a cup of coffee (it can be tea too) and have a little treat with it. It can be sweet or savory, and if anything, fika is more about the moment than it is about what you are actually consuming. It’s about meeting up with friends, taking a little time out of the everyday to savor a break. So you can see why Friday Fika makes sense. “TGIFika” as I learned from Fika London. There are many traditional Swedish recipes that are perfect for fika, and there are alot in the Fika book. 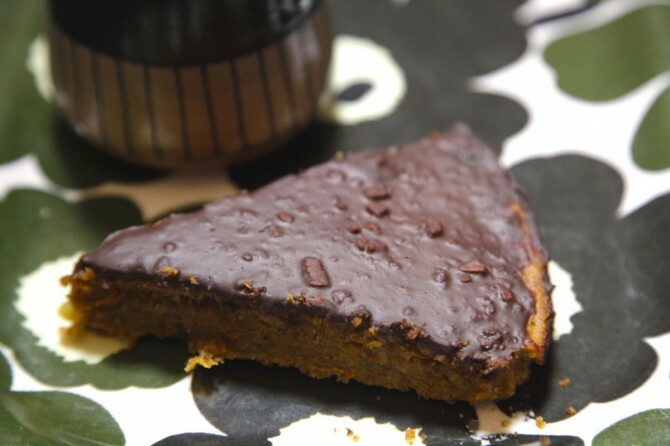 But for today’s Friday Fika we’re going to do something a little different; a morotskaka med chokladganache. 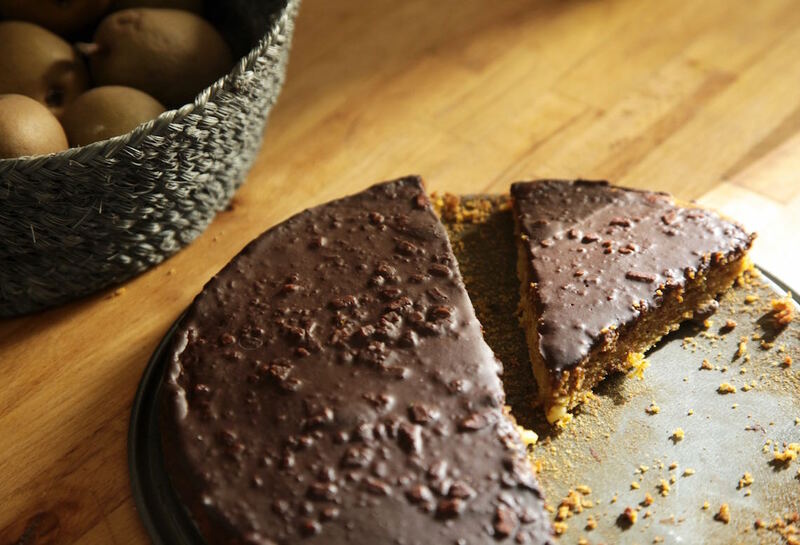 A carrot cake with chocolate ganache. You might think that carrot cake is an anglophone thing, but they’re quite common in Sweden, and with good reason: who wouldn’t want a cake made with root vegetables? Because I am practical, this carrot cake is just slightly adapted from a recipe I did a few weeks ago. But this time it got a chocolate ganache as an icing, also taken from a previous recipe. Proof that fika doesn’t need to be complicated, you just need to work with what you have. Finely grind the almonds and in a bowl, mix together with the rice flour and baking powder. Set aside. Fold in the spices and the dry mixture, followed by the grated carrots and apples. Stir in the milk so you get a batter consistency. Remove from the oven and let cool for about 10 to 15 minutes. When slightly cooled, pour the freshly made ganache (recipe below) over the top of the cake. To make the ganache, crush the dried citrus peels in a bowl and mix together with the chili powder. Finely chop the chocolate and add to the bowl. Pour the rice milk into a saucepan and bring to a simmer on medium heat. Remove from stove and pour over the chocolate. Let sit for 2 to 3 minutes, then stir the melted chocolate and milk together until well blended. Pour over the cake and let cool a bit to set. This cake sounds great! Can’t wait to try it. Just a head’s up, your link to your new book, in this post is broken. Thanks for the recipe. Looking forward to the new book. I loved your first! Thanks for the heads up Jane! I have now fixed the link 🙂 Thanks for reading and following along. Book is officially out April 7!